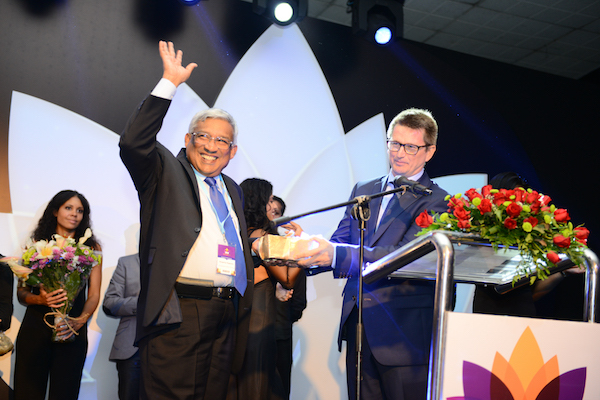 IFEAT 2015 Sri Lanka Conference Report - Ultra International B.V.Ultra International B.V. The IFEAT Annual Conference was held at the Cinnamon Grand Hotel in Colombo from September 27th – October 1st 2015. The large hotel complex combined with satellite hotels nearby enabled delegates to meet up with colleagues and customers as well as participate in the lectures and workshops which were based on the theme of Asia: Source of Essential Oils and Medicinal Plants. The Conference seems to increase in size with each passing year and it was necessary to close registrations some weeks prior to the start of the Conference. The number of registrations reached 1050 (unofficial) delegates and 76 accompanying persons. In addition, during the course of the three days of lectures, there were a number of day delegates. As with previous conferences, delegates started to arrive over the weekend with Sunday showing the majority of the delegates arriving and registering. At registration delegates collected the Conference briefcase containing various briefing papers as well as a number of gifts, including some provided by Conference sponsors. On the evening of Sunday 27th September the Welcome Reception was held in the Kingsbury Hotel. An elaborately attired elephant welcomed delegates – and fortunately the heavy rain earlier in the day had abated. While music played and canapés and a range of other excellent food were served, delegates were able to mingle with one another and get the week’s conference off to an excellent start. Sunday was a full moon (Poya Day) when it is against the law to serve alcohol and all places of entertainment are closed. Fortunately the Local Organising Committee was able to get special dispensation both for alcoholic drinks and excellent entertainment. 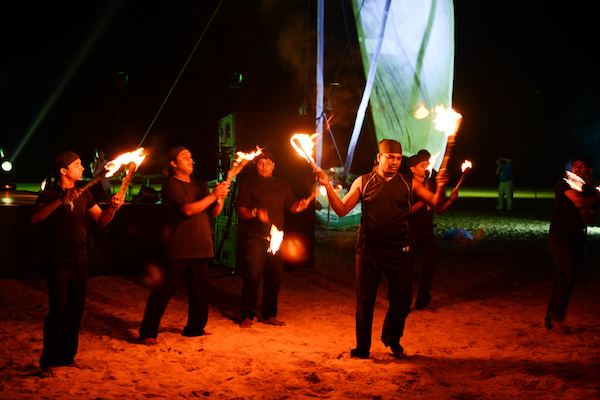 The entertainment included drummers, dancers, a jazz quartet, calypso music and a fusion band. At 09.00 the Opening Ceremony started with some beautiful traditional dancing by 12 beautifully dressed female dancers preforming before a large audience. Then followed the official opening by Dr Devapriya Nugawela, Chairman of the Local Organising Committee, supported by Alain Frix, Chair and Antonella Corleone, Vice Chair of the IFEAT Executive Committee. IFEAT introduced some changes to the conference programme this year. There were two sessions per day (morning and afternoon) instead of three. The aim was both to allow delegates to plan their meetings better as well as increase the number attending the presentations. On both counts the Conference seems to have been successful. In addition, two innovative sessions were introduced this year, in line with developments in the essential oils industry and the overall theme of the 2015 IFEAT Conference. The first session, chaired by Dr. Devapriya Nugawela, was on “Asia: Innovative Supplier of Ingredients” and there were three presentations dealing with developments in Indonesia, Sri Lanka and India. The first was by Ravi Sanganeria of Ultra International B.V., Netherlands and Van Aroma, Indonesia on Indonesia: current and future market dynamics. The presentation reviewed the challenges and opportunities facing Indonesia’s ingredient supply sector with particular emphasis on Indonesia’s current and future market dynamics with detailed assessments on clove, patchouli, nutmeg, citronella and vetiver oils. The analysis also discussed a range of challenges, including climatic changes, especially the impending El Nino, as well as logistical, economic and currency factors. (CLICK here to download the full paper). The second presentation was by Chamila Perera of EOAS Organics Pvt Ltd, Sri Lanka on The cinnamon bark oil industry in Sri Lanka. The presentation provided an overview of the cinnamon bark oil industry, including the areas in which cinnamon is grown and the different qualities of cinnamon bark oil and how these are achieved. The main component in cinnamon bark oil, namely cinnamic aldehyde, varies according to distillation methods, the part of the island where the cinnamon comes from and the maturity of the bark that is distilled. Methods of distillation in the country vary from traditional hydro distillation to supercritical fluid extraction. A historical overview of the trade in this oil was provided along with analyses how demand and supply have changed over the years. It touched on the Sri Lankan organic cinnamon bark oil industry and what lies ahead in terms of innovation and further value addition. Further, it looked into the issues faced by the industry and how these may be overcome in the future. The final presentation of the morning was Vishal Menon of Synthite Industries Ltd, Cochin, India on Old wine and new bottles: leveraging innovation opportunities for Indian spices. His argument was that India, the ubiquitous purveyor of spices, is quietly transforming itself into a “Global Collaboratory” where experiences, expertise and insights from around the globe are shared to create ingredient innovations and solutions that have the potential to transform the way we see and use spices. As sources of essential oils and other natural derivatives, spices have an exceptionally versatile range of applications. India offers the heritage of the 3,000-year-old spice trade bundled with leading edge science and technology capability to meet the needs of a demanding end consumer. The presentation provided examples of how Indian spice-based natural products are changing the way several consumer and industrial products are created, marketed and consumed. The second session in the afternoon was chaired by Winnie Yeung and was on “Medicinal Plants in Healthcare Food and Cosmetics”. The first presentation was by Professor Geoffrey A. Cordell, Natural Products Inc., Evanston, Illinois, USA on Ecopharmacognosy and the sustainability of commercial natural products. Ecopharmacognosy is the study of sustainable, biologically active, natural resources. It provides a conceptual framework for developing new strategies and scientific perspectives for natural products, which can assure future product accessibility and beneficial outcomes. The presentation examined some aspects of natural product development, and discussed how the precepts of ecopharmacognosy can be applied in developing natural products, whose quality is controlled, for society, based on various integrated technologies. The second presentation of the afternoon was by Prof. Lei Yao of Shanghai Jiao Tong University, Shanghai, China on Study of different lavender cultivars and the effect of English lavender essential oil on insomnia relief. The presentation was given by her daughter and provided a brief overview of Chinese lavender oil production and markets. Then followed the results of an investigation, using the RAPD technique (Random Amplified Polymorphic DNA), into the genetic diversity of 10 lavender cultivars available on the Chinese market. The botanical characteristics, essential oil content and composition of the flowers of these ten lavenders were compared. Among them, the composition of lavender cv. “English” was preferred. In addition, the effect of inhaling the essential oil of lavender cv. “English” on sleep was assessed. Inhalation at a certain concentration increased sleeping time significantly in mice. Also twenty volunteers with sleep disturbances were recruited and inhaled lavender oil. SCL-90 scale and EEG recording before and after inhalation were used to measure the sleep effect. Results showed that 9 cases of insomnia symptoms were significantly improved, 6 cases were improved and 5 cases did not show any effect. Following the AGM, the IFEAT Chairman provided the Annual Review of IFEAT activities during the successful past year. In addition, there were presentations on the ICATS fragrance and University of Reading flavour educational courses, which are supported by IFEAT. A best student medal was awarded to Pei-Lun Lin from Taiwan who participated in the Reading flavour course. Other presentations included a short review of the very successful France Study Tour, which took place from the 5th – 15th July 2015, and a presentation on the 2016 IFEAT Conference, which will be held in Dubai from 25th– 29th September 2016. The IFEAT Medal was awarded to Dr. R.O.B. Wijesekera, a Sri Lankan scientist and researcher who spoke eloquently on Science as the key to nature’s bounty. This fascinating and wide-ranging lecture analysed and reflected on the changes, challenges and paradigm shifts faced in a career spanning six decades and involving work in many countries on essential oils, medicinal plants and spices. Among the topics covered were changing research methods with the old order giving way to new chromatographic and spectroscopic techniques; institutional and team building activities at the CISIR Colombo and the creation of a leading edge research capability in analytical methods, quality assurance and creation of quality standards; the development of new and innovative distillation technology; working for international organisations and the transfer of technologies and research capabilities to Nepal, Turkey, Vietnam, Madagascar and Thailand, facilitating industry development, and the creation of the Kannauj Fragrance and Flavour Centre in India with state-of-the-art methodology. Dominique Roques chaired the afternoon session on “Social Achievements in the F&F Industry”. The four presentations were quite diverse in their content but all very interesting. The first was by Robby Gunawan of PT Indesso Aroma, Jakarta, Indonesia on The journey of sustainable patchouli. Like many agricultural commodities, patchouli is prone to uneven production driven by myriad factors. Price fluctuations affect stakeholders at multiple levels of the supply chain, including thousands of small-scale farmers, threatening the long-term sustainability of this important fragrance ingredient. Firmenich and Indesso realised that a specific targeted programme to improve the situation of small-scale patchouli farmers could have a considerable positive impact on farmers’ livelihoods and help ensure the long-term viability of its supply chains. The presentation explained the journey of both companies in developing sustainable patchouli sourcing through a transparent business model, which started with the top management commitment and was followed by a baseline study conducted in selected patchouli growing areas in Java. This business model, which simplifies the supply chain, promotes fair trade principles, and encourages farmers to set a business entity in the form of cooperatives, has shown promising results. The second presentation was by Sheetal Desai and Kamna Mago of CPL Aroma India Pvt. Ltd., Mumbai, India called Fragrant Vision. The presentation showcased the work being done by the F&F industry collectively in order to empower the visually impaired and to tap the hidden potential of their gifted senses. They discussed the work of COFVI (The College of Fragrance for the Visually Impaired), which is the unique educational initiative set up in Mumbai and funded by fragrance industry companies. Alongside a video, the presenters shared their personal experiences of the project, throwing light on how the visually impaired are an asset to their organisation and the vision and plans for the future of this noteworthy project. Nikunj Harlaika of GC Herbals, India gave the third presentation on Community Based Production and Organic Certification of Aromatic and Medicinal Crops in India. India has been one of the leading producers of essential oils for industrial applications. The journey began from lemongrass oil in the 19th century to menthol and mint-based derivatives in recent years. As the consumer demands more traceability, community-based projects in the country are reaching out for organic certification and fair trade carving a niche for them. The presentation, which was very well illustrated with some 150 PowerPoint slides, covered the journey of these marginalised communities and the ways in which they are keeping up with the changing consumer preferences and regulatory requirements. The final presentation was by Elisa Aragon, Nelixia S.A., Guatemala on Implementing an effective and meaningful sustainable project: cardamom oil case study. What do social achievements really mean for the F&F industry? Why are they so important for ensuring long-term availability of natural raw materials? What should be the role of each party in this important matter? Based on answering these questions, the presentation detailed the vision of Nelixia on the methodology of implementing an effective and meaningful sustainable project in all its aspects: social, environmental and economic and what indicators should be looked at in order to measure the impact.The presentation detailed how Nelixia is concretely adapting this methodology for cardamom oil in Guatemala. The cardamom crop is a good example as it is produced by more than 350,000 small growers’ families in the poorest region of Guatemala, and whilst not at a huge risk today, is starting to present signs of decline. The Annual IFEAT Dinner was held on the evening of the 29th at the attractive Hotel Jetwing at Negombo Beach. The heavy Colombo traffic meant that it took over an hour by coach to reach the venue, but the journey was well worth it. The buffet food provided in a large marque on the beach was superb. The meal was interspersed with some superb Bollywood-style music and dancing, Hindi music, a Beatles tribute group, an all-girls vocal trio, a fusion group and a superb firework display followed by dancing. Wednesday saw two workshops each with some 30 participants: the Perfumery Workshop given by Joanna Norman and the Medicinal Plants Workshop given by Prof Geoffrey Cordell. The interactive fine fragrance workshop explored perfumery trends in terms of raw materials (both natural and synthetic), accord strategy and multi sensory appeal. Joanna guided participants through the key drivers of fine perfumery, which in turn influence fragrance trends in all categories. The workshop included a hands-on exploration of all the senses and a ‘create your own fragrance’ exercise focusing on how to communicate smell. The overall objective of the workshop was to provide participants with detailed insights into what the perfume brands are looking for. to explore the UNESCO World Heritage Site. To Kosgoda to see cinnamon grown and processed at Dassanayake Walauwa Plantation, then a visit to HDDES Extracts (Pvt) Ltd., a cinnamon leaf distillation unit. Industry visit to Dompe to visit the herbal healthcare products factory of Link Natural Products Pvt. Ltd. The third day of lectures concentrated on market and technical developments, as well as legislative and regulatory issues. The morning session, chaired by George Paul, was on “Market Developments and Trends of Naturals”. The first presentation from S. Ramaswamy of the Centre for Cellular and Molecular Platforms, Bangalore, India was on Molecular engineering for flavour and fragrance compounds. In a wide-ranging presentation on synthetic biology, he explained that the use of microbes in the food industry is an age-old technique used from brewing beer to curdling milk. Recombinant DNA technology and our ability to express heterologous proteins in microbes has allowed for the use of these microbes in the production of novel chemical compounds. This method of production of chemicals has been routinely used in the pharmaceutical industry for biosynthesis of active pharmaceutical ingredients. A very common edible fungus, yeast – used in brewing and baking – into which new genes are introduced is often the vehicle for production of these chemicals. These engineered microbes themselves are not consumed, only the products that are made by them. While the techniques have all developed over a period of time, the collective use of these techniques today has been given a new name – synthetic biology. These techniques allow the farmers to create new products hitherto not easily possible thus expanding their repertoire with novel and interesting properties. The second presentation was by Nisha Shah of Fine Fragrances Pvt. Ltd, Mumbai, India on Biotechnology, sustainable farming and aromatic crops. The flavour and fragrance industry is witnessing a growing demand for natural ingredients, a large portion of which is composed of essential oils. While traditional cultivation practices are being utilised, the presentation highlighted the potential for biotechnological methods to be applied in the development of aromatic crops to increase yields and returns to the grower. The presentation discussed sustainable farming practices and the crucial role they can play in the production of these crops as well as assist the grower in reducing costs. The combination of biotechnology and sustainable farming is a potent one that not only offers good returns to the grower and subsequently the buyer of the oil but also does so in a manner that plays a “green” role in maintaining the balance of the ecosystem – a condition much needed in today’s world. Two short videos were shown illustrating aspects of this biotech work. Catherine Peyreaud of the Natural Resources Stewardship Circle (NRSC) based in Grasse, France made the final presentation of the morning on The positive impact of a collective action in the field to sustain the sourcing of natural ingredients for the beauty industry. The NRSC is made up of a group of F&F companies including leading brands (including Clarins, Hermès, Chanel, Yves Rocher, Estee Lauder, Chanel, P&G, Prestige and Puig); ingredient manufacturers (Givaudan, IFF, Firmenich, Mane, Takasago and Payan Bertrand,) and producers (Albert-Vieille, Agroforex and Beraca). This group of world leading beauty industry executives decided to rise above their status as competitors and work together to protect biodiversity in their supply chains and improve the living conditions of the local producers and populations concerned. The NRSC members are conscious of the positive contribution they can have on biodiversity through biological resources, sustainable valorisation, and especially through partnership with local producers and communities. Inviting the various stakeholders of the supply chains concerned to join the initiative in order to build together and implement best practices confirms, “Working together truly makes a difference”. The presentation also included a video on the NRSC’s work with vetiver in Haiti. SAWS (The State Administration of Work Safety) order 53 (Measures on the Hazardous Chemicals Registration): hazardous chemicals need to be registered to SAWS with GHS compliant SDS and label. SAWS order 60 (Measures on Physical Hazard identification): F&F industries need to perform physical hazard identification in designated labs for chemicals with uncertain hazard properties in China. MEP (Ministry of Environmental Protection) order 7 (China New Chemical Substance Notification): all the new chemicals not listed in IECSC will be required to register to SCC-MEP. Taiwan TCSCA (Toxic Chemical Substance Control Act) entered into force at the end of last year (Dec 11, 2014), almost all fragrance and flavour products will be required to comply with Taiwan TCSCA when placed in the Taiwan market. The obligations of F&F industries refer to new chemical substance notification and existing chemical substance notification. The IFEAT Conference ended with the Closing Banquet held at the Sri Lanka Exhibition and Convention Centre Hall in Colombo. The superb 50-person Sri Lanka Symphony Orchestra got the proceedings underway with a collection of classical and modern orchestral pieces. The Founders Award was then presented to Joao Ernesto Dierberger of Brazil, who was very much involved in the early days of IFEAT. The award was received on his behalf by his son Joao Andreas Dierberger. Then followed an excellent sit-down meal served to approximately 800 participants. Both during and after dinner, delegates were entertained with a range of superb Sri Lankan singing, dancing, a medley of American show tunes and mime and finally delegate dancing until 2AM, bringing to an end another successful conference. Presentations made during the Conference will be available to members for downloading from the IFEAT website at a later date (www.ifeat.org). Last dance for this year's conference!